Here is a quick deal which you might find useful. Expedia US is running a very silly deal today (Thursday, no guarantee it still works on Friday!) offering $30 off a $40 ‘experiences’ purchases. All you need to do is go to the ‘experiences’ page of expedia.com (not UK) which is here. Put $40 of products into your basket for December – seems it needs to be December – and add promo code ‘THANKYOU’. Here is an example of what you can do. 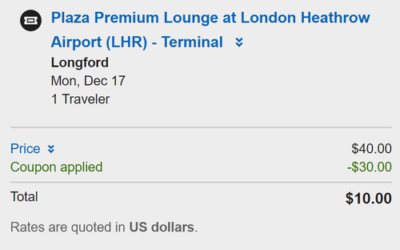 The Plaza Premium Lounge at Heathrow Terminal 5 is $40 exactly. Book a place, use the code and you’re getting in for just $10! You’d need to make separate bookings, potentially on different credit cards, for extra guests. I’ve no idea how long this will last. There is loads to go at – museums, restaurants, lounges etc. I doubt it will last long though. Only works for dates this year. +1 chuffed with that. Been wanting to visit for years. I wanted to go years ago and went year’s ago! its £32 for two tickets that’s almost 4 times the price of these tickets! These tickets are even less expensive. Life is busy so kept putting of the visit but this has made me actually book it in. You missed out, you get comp tickets if you get married there! That will mean Prince Charles will get in there free too then. No, tickets work in either direction (peak time rules not withstanding). I am trying for a boat excursion on the Firth of Forth under the 3 bridges but every time I put a date in it says the code is not available. Trying lots of different dates and still not working. Annoying! Duh! helps if you read the article properly! Thanks Shoestring! Booked an afternoon tea boat trip on the Firth of Forth to see the 3 bridges next week. Heading to Edinburgh that day anyway for a show and to do some small shop shopping. Should be a good day! Have you seen the weather? Do you really still desire such an ‘experience’? Well, I just don’t get a link to put the promo code in. Above the logos, below the title Payment, click the text: “Enter a coupon or promotion code”. Does it not open up a text box? No, the link just doesn’t show. I have managed to make it show, but only if I only have one type of ticket in the basket. I was trying to have two types (roughly $32 plus $10) and it doesn’t show. All London tickets booked for December. Thanks for this.. I booked indoor axe throwing at Axe Monkeys in Las Vegas for tuesday next week. Was $25 each for an hour and netted down to $20 all in with $30 saving with this promo. Done in before.. Its super fun and can reccomend it highly for anybody looking at doing something new next time they are in Vegas…Google for more information. You didn’t fancy the Rage Room? just booked to take the other half to Planet Hollywood, 3 course meal and soft drink comes to a tenner each after discount. Holidaying in Australia at the moment – got a great deal on the skydeck in Melbourne for this weekend. Thank you! Thank you for this. Off for a Sydney harbour cruise and tour of the Rocks tomorrow. Had to use two different credit cards. Now dead. Managed to book robot restaurant in Tokyo for my 6 hour layover tomorrow, 2x Sydney airport minivan transfers and some activities in NZ. Love it! Enjoy the Robot Restaurant in Tokyo. It’s the most surreal thing I’ve witnessed! I grabbed a couple for 3 hour LHR T5 departures . The heading says this on the vouchers I received in my email. But all the text refers ot T2, redeeming it at T2, etc??? Did anyone else receive wording on the voucher that they received, maintly for T2 when they ordered a voucher for T5? Same for me. Emailed the lounge, but nothing back… Just got one entry for my Christmas flight. Expedia impressed me by speaking to plaza lounge manager at lhr. He confirmed plaza p is aware of text about T2 even on plaza p passes for other terminals and confirmed to expedia you will be let in OK to the lounge you purchased that is in the heading of your voucher.